Argan oil is one of the best natural oils for hair breakage and shiny hair. It’s a versatile oil that delivers what it promises when used correctly on hair. Before we share some excellent argan oil recipes, let’s break down argan oil. Argan oil is produced from the green nut of the argan tree, which grows in Morocco. Only coming to the mainstream limelight in recent years, argan oil has been popular in Morocco for centuries where it’s renowned for its nutritional and cosmetic properties. The tree from which Argan oil kernels are found can survive for years in the desert. This species, Argania, once covered North Africa. Unfortunately, it’s now endangered and under the protection of UNESCO. Argan oil is one of the rarest oils in the world. The extraction process is specific, manual and labor intensive. 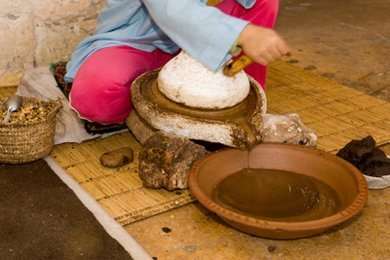 The laborious task of producing argan oil is usually carried about by women of the Berber tribe in Morocco where it supports the local economy and provides a lot of women with employment. Argan oil is rich in natural antioxidants, essential fatty acids like omega-3 & omega-9, carotenoids, ferulic acid, sterols, and polyphenols. It also contains a significantly high amount of vitamin E and squalene. Argan oil is frequently referred to as liquid gold due to its perceived miraculous and regenerative effects on the skin and hair. While the oil has properties similar to jojoba oil, its effects are different. The best kind of argan oil is the 100% pure variety, which hasn’t undergone any processing. Can you Consume Argan Oil? Culinary argan oil is used to prepare a traditional Middle Eastern desert known as amlou. It is also used as a dipping sauce and in the preparation of salads. Read How to Use Argan Oil for Cooking. 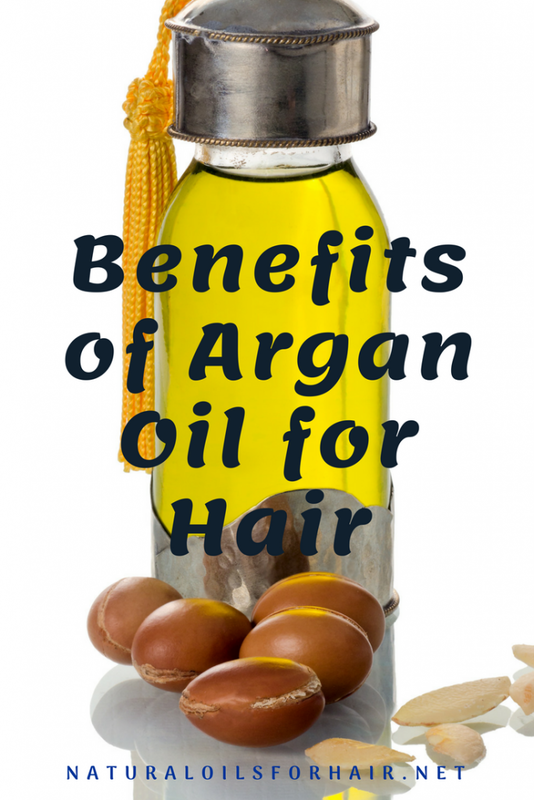 Argan oil helps hair to lock in moisture for longer. If you’re practicing the LCO (liquid, cream, oil) method for hair care, argan oil can be used as the oil. Read The Difference Between the LOC vs LCO Plus Which Version is More Effective. Argan oil fortifies the hair strands to enhance elasticity. Elasticity is a sign of very healthy hair. When you pull on some strands of your hair gently when it’s wet and it bounces back when you let it go; that’s a sign of elasticity. In addition to promoting elasticity, argan oil also reduces split ends and helps manage hair breakage. Argan oil tames frizzy hair, smooths down flyaways and promotes shiny and glossy hair. A few drops applied to hair in its pure form before or after styling does wonders for hair. Vitamin E is very beneficial for hair and helps keep hair soft. Argan oil has this vitamin in abundant quantities. Included in deep conditioning treatments, expect it to soften even the toughest of strands brought on by mishandling hair and other harmful hair care practices. Read Nourish, Soften and Enhance Hair with Vitamin E.
The chemicals used to purify swimming pools as well as salt in seawater seriously dries out the hair. Before going into the water, apply a few drops of argan oil to your strands for protection. When you wash your hair after swimming, apply a few drops of argan oil again to put the bounce back in your hair. For the best ways to use argan oil on hair and get the best uses out of your bottle of liquid gold, read 5 Ways to Use Argan Oil on Hair. How Does Argan Oil Help Hair Growth? If you’re suffering from endless split ends and hair breakage, which are contributing factors to hair loss, including argan oil in your regimen will help treat these issues and promote healthier hair growth. For the best natural oils and methods for hair growth, have a look at the hair loss and regrowth archives. Always buy ethically sourced, authentic argan oil. Don’t buy culinary argan oil for use on hair. Culinary argan oil is roasted and processed for consumption purposes, and won’t be as effective for the hair. I have recommended my favorite 3 brands below but for even more options, read Top 10 Organic Argan Oil Brands for Skin and Hair. For resources on healthy hair care and growth, have a look at the Healthy Hair Care series and products available in our shop. Subscribers get up to 20% off. See the deal HERE.